The most recent version of Firefox Nightly, the browser's cutting edge version, highlights the add-ons that are not WebExtensions with the Legacy tag. One of the concerns that Firefox users who run one or multiple add-ons in the browser have currently is whether their add-ons will make the cut when Firefox 57 comes along. It is in this version of Firefox, out November 2017, that Mozilla plans to drop support for so-called legacy add-ons. The move blocks any non-WebExtension add-ons from working in the browser. In fact, users won't be able to install legacy add-ons when Firefox 57 hits, and the add-ons that they had installed before the upgrade to the new version of the browser won't be there anymore after the upgrade. It is a clear cut that Mozilla plans, one that is welcome by some and disliked by others. For Mozilla, moving Firefox's extensions system to WebExtension exclusively means a reduction in extension caused crashes and performance issues, the freeing up of development time because extension compatibility is less of an issue, and that users won't face that many issues anymore caused by add-ons. The naysayers of the move point out that Firefox will lose part of its add-on ecosystem, and with it add-ons. Extension won't be as powerful anymore, and are restricted in what they can do as they rely solely on the APIs that Mozilla creates. Some features that legacy add-ons offered are simply not implementable with the new WebExtensions system. Firefox users who run add-ons currently are also concerned when it comes to the add-ons that they are using in the browser. Will those make the cut, or won't they? It was quite difficult up until now to come up with an answer. 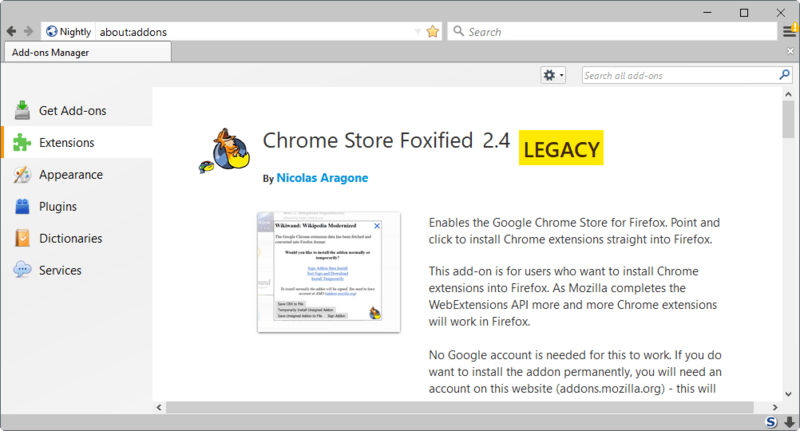 The release of the latest Firefox Nightly version changes that, as legacy add-ons are tagged as that in the browser's add-on manager. Load about:addons in the Firefox address bar. Firefox should highlight all legacy add-ons right in the interface. Note: If you run Classic Theme Restorer, or another add-on that modifies the browser UI, you may not see the legacy tag there. You may see it with a click on the more link though. Click on the "more" link next to an add-on. Firefox displays Legacy next to the add-on if it is a legacy add-on. Please note that some developers are working on porting their extensions to the WebExtensions system. While these may be listed as legacy currently, they may be released as WebExtensions before the cut so that you may continue using them. Still, the tagging of add-ons as legacy makes a whole lot of sense. Mozilla should, and probably will, move the tagging to Beta and Stable versions of Firefox in the near future. Until the Legacy add on question is sorted, use FF 52.0.1 (64 bit) ESR or FF 52.1.0 (32 bit) ESR. The 64bit version exists for all versions. Did you READ my post ?? “Until the Legacy add on question is sorted, use FF 52.0.1 (64 bit) ESR or FF 52.1.0 (32 bit) ESR”. That’s the point of forums. Of course the announced removal of legacy add-ons is bothering for those who care for one or several add-ons which are said by their developers to not be “upgradable” to a WebExtension or to not meet the developer’s will to rewrite them (quite a deal of work often especially with complex add-ons). I have ~70 add-ons and I know i’ll have to reconsider, rethink my Firefox global configuration when faced to no alternative. Also, as a computer teacher would then repeat (yep, was a time I intended to become a system programmer! ), the machine is just an amount of steel and various components and code a suite of logic, it’s not life. It’s a fantastic tool, but it’s not life. @Tom Hawack: Switch to Waterfox or wait for the Firefox fork the Pale Moon team currently has in the making, and get over it. There is no need to stay with Firefox. @Appster, of course there are alternatives and I do consider them. The problem with Waterfox is the long-term. It’s developer on the browser’s home page does mention, concerning the future of Waterfox faced to deprecating XUL/XPCOM and moving to WebExtensions, that he “has plans” but that “they are not concrete”. From there on, what’s the scheme? As I see it browsers based on Firefox will have at one time or another to either emancipate as ‘Pale Moon” did for some time now or stick for years on latest Firefox non-WebExtensions code which will become itself deprecated. I don’t wish to “throw the baby with the bath water” (or however you say that in proper English). I’ve tried in the past ‘Pale Moon’, Cyberfox and Waterfox. I came back to Firefox for the simple reason that, then, I had noticed no significant improvement of those browsers over Firefox. Of course things have changed since, ‘Pale Moon’ has totally emancipated and Firefox meets the Webextensions and Electrolysis requirements to come. So I’m most likely to experience again,those browser alternatives, mainly on the ground of webExtensions and Electrolysis. I’m not a fast decider but should I be faced to what seems to me a kill-switch than I could, possibly, move to another default browser. But not being a fast decide also has its advantages, as to not abandon what we’ve liked for years (and still do) on the ground that obstacles (or perceived as such) are on our way. If no fixations, stubbornness blinds us there are no true problems unless to consider that choosing the best option is itself a problem. And it often is! I agree. It’s much less work to see the potential impact of v57. The Mozillians don’t want it to be that easy. It’s shown in the add-on list. Only if you don’t use Classic Theme Restorer. Vivaldi sadly feels really clunky. Mousegestures take too much time and the browser is really really slow with lots of tabs (it takes nearly 10 minutes (yes I measured it)) to start for me. FF with the same amount of tabs only 30s. IOW CTR needs an update. My unsigned Ublock Origin Webextension marked as legacy too, why? I think gorhill said that currently uBO is a ‘hybrid’ add-on, so a combined Legacy and WebExtension. No, there is usual version that is ‘hybrid’ with embedded WebExtension on AMO and full WebExtension unsigned on GitHub. Maybe because it is not signed? Could be that Mozilla pulls the info exclusively from AMO, and not from the user’s addon listing (note: I don’t know how this is determined). Yes. I believe this is necessary to transition legacy users to webextensions because webextensions may not have access to the legacy addon’s settings & data. Both browsers support unsigned extensions as well. Might be another advantage. Both are also one-man operations that may not last longer than the current ESR schedule. Nope, I can’t switch based on that kind of uncertainty. Not when Waterfox might go the way of Cyberfox and Pale Moon will render itself more & more obsolete as time goes on. A return to a browser that looks like IE6 has no appeal to me whatsoever. > Some features that legacy add-ons offered are simply not implementable with the new WebExtensions system. Well they are, Moz just will not bother with it if you are one of the 99% scum programmers for addons. > The preference API will *NOT* be added. So, It is impossible to convert Configuration Mania to a WebExtension. I think that’s a bit of a terrible/minor example. Locking down firefox internal prefs and limiting extensions to their own preferences is a good thing IMO, and certainly surmountable via other means. Part of that locking down internals actually makes FF more secure (even simpler). But I agree, the lack of a nice interface from an extension is a loss. Not everyone likes user.js files. But you are right, loss of functionality due to a less power API is a bummer. Maybe better examples are CTR and Tab Mix Plus or whatever its called. Only time will tell how much Mozilla adds back in (not holding my breath – it will takes years), and by then it will be too late for those developers (but new devs may come along). I believe the ‘Configuration Mania’ as it is and without generalizing to all internal or not switches is a most handy tool for all and that includes users who wish to dig a bit further than the settings offered in Firefox’s options only. The add-on handles more than simple switches, it includes a search feature as well as a per-settings (or per settings group) reset feature. It also shows FF version limited/obsolete settings. I’ve always call upon 1- FF Options, 2-about:config, 3-Configuration Mania and 4-user.js (mine, based essentially on Pants’ Ghacks user.js’ to conduct my take-offs, cruise and landing FF operations! i did mark firefox as legacy. I’ll be heading to Vivaldi for the tab customization I’ll lose when Tab Mix Plus no longer works. I’ve talked to several people and it looks like Vivaldi is going to be the biggest beneficiary of the FF 57 change. After all, Vivaldi’s purpose is to be the power user’s browser with plenty of customization built-in plus support for WebExtensions. To be clear, WebExtensions will not be fully supported by Vivaldi, or any other Blink-based browser. The goal is for Firefox to support all Chrome extensions, but implement additional features on top of that which Chrome (and Chrome-based browsers) will not support. As FF gets bigger and bigger (metaphorically), they seem to forget who the end user is and what we want. One of the draws (besides the obvious “It’s NOT MS-IE”) was the add-ons. Limiting and eliminating them has taken what I’ve appreciated most about FF and thrown it away. I understand the desire of Mozilla to spend less time making sure the add-ons play nicely, but perhaps a small dedicated team of developers that can work with add-on developers to certify their applications work correctly, rather than abandoning them almost altogether, would be a better solution. If I want to install an unsigned app to my FF and hit my proverbial thumb with the proverbial hammer, that’s my business. Give me a warning window that makes me assume the risk and let me swing away.